Now more than, sustainability is becoming a bigger issue in industry and manufacturing. There are many considerations to make when looking at sustainability in the rubber industry. As rubber is a raw material used worldwide, it’s important that we all work together to ensure that the supply of rubber will last as long as we need it to. Natural rubber comes from tapping plants, which makes it a renewable resource. It can be continued to be renewed as long as we take care of it. This proves difficult as the demand for rubber increases. However, it is because of this demand that it is all the more important that it is produced in a sustainable way. Traditionally rubber hasn’t always had the best reputation, so companies must be careful where they source it from. Even if the end product is the same, it doesn’t mean that the way it is harvested and processed is sustainable. This includes sustainability for rubber plantations and managing the loss of natural forest habitat. As rubber trees can’t continually produce an unlimited amount of rubber, more area needs to be cleared to plant new rubber trees. Unfortunately, this means getting rid of native trees, sometimes through the methods of clear-cutting and burning. Using a supplier that has end to end transparency in their supply chain helps to make sure that the rubber comes from a sustainable source that has minimal damage to the environment. In addition to the trees, it is important to choose a supplier that harvests rubber in a way that minimizes carbon emissions. There are many gains to be made in minimizing carbon emissions during transportation as well. This is especially important as there are no domestic means of growing rubber plants, so must be transported from places like Southeast Asia where it is grown. But sustainability doesn’t just extend to environmental considerations. We must also labour and ethical considerations in which rubber workers are paid a fair wage and have safe working conditions. This includes re-examining policies and partnerships regularly to see if they still meet sustainability standards. 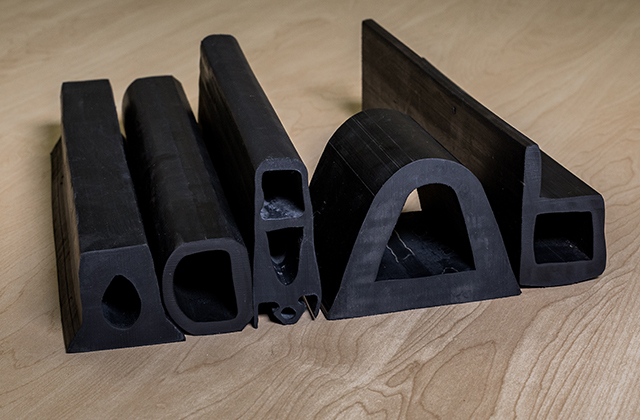 Synthetic rubber has different issues to consider surrounding sustainability. As it is made through a petrochemical process, it can be manufactured anywhere that the byproducts can go. However, petrochemicals are laborious to extract and aren’t a renewable resource – we may one day run out of them. There have been recent developments in trying to make a more sustainable version of synthetic rubber. In particular, a team from the University of Delaware, the University of Minnesota and the University of Massachusetts have been working on this. So far they have invented a process that takes plant-based sources, such as trees, grasses and corn to make butadiene. As technology advances, there is a greater possibility that we will see more innovations in manufacturing around renewable resources replacing non-renewable resources. Whether using natural or synthetic rubber, there are always ways to make the sourcing and manufacturing sustainable.